A Picture’s Worth, a one-act play performed by Eagle Hill School’s theater department has advanced to compete at the Massachusetts Educational Theater Guild (METG) DramaFest State Finals. 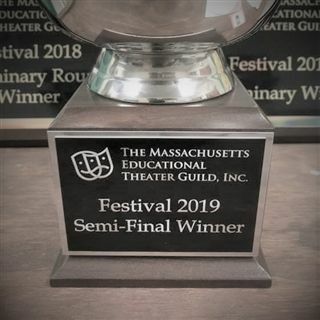 This prestigious honor was awarded after Eagle Hill students performed against forty-two schools across the state in the Massachusetts High School Drama Festival semi-finals held on Saturday March 16th. Only fourteen high schools advanced to the final round (including Eagle Hill). The student performers were judged on excellence in acting and technical design. In addition, actors Zach A. ‘19 and Ian R. ’19 each received individual ALL Star acting awards for their extraordinary onstage performances. Jake G.’19 received the ALL Star award for excellence in technical theater for sound design. Written by Eagle Hill School’s Star Resident, Jeremy Geragotelis and directed by Theater Arts teacher, Will Gelinas, A Picture’s Worth is a one-act play performed entirely in a girl’s high school bathroom. The play touches on emotional themes often experienced by high school students—identity issues, mental health and suicide. The Drama Festival competition began on March 2nd with 112 high school one-act plays performing on three levels – preliminary, semi-final and state. The State Final performances will be held in Boston at the Back Bay Conference Center, John Hancock Theater, on March 28-30th. Eagle Hill's performance is scheduled for Thursday, March 28th at 6:00pm.